Madine, Drumaness Died November 3, 2018, (peacefully), Edmund (Eddie), beloved husband of Suzanne, and loving father of Louise, Laura, Kerrie and Niamh and brother of the late Hugh, 67 Crawfordstown Road R.I.P. Deeply regretted by his wife, daughters, brother Paul, Sisters Angela and Kay and family circle. 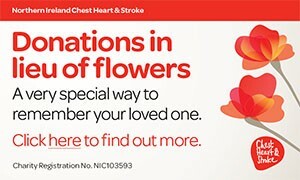 Family flowers only please, donations in lieu to Liver Support Unit, RVH, Belfast c/o Gerard McMullan Funeral Director, 47 High Street, Ballynahinch BT24 8AB. I am sorry to tell you that Edmund (Eddie) Madine has passed away.